Customized exclusively to be used inside of the chamber area, the Chamber Clean™ Swabs are excellent for the reduction of chamber dust. These specialized swabs are constructed from polyester to prevent any residual fabric or fiber contamination while easily removing grit and grime. They are tailored to be used with VisibleDust Chamber Clean™ solution. 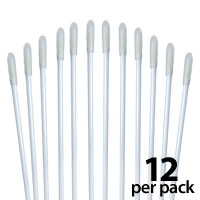 12 Swabs per package.